Why do nations go to war? What are citizens willing to die for? What justifies foreign invasion? And does might always make right? For nearly 2,500 years, students, politicians, political thinkers, and military leaders have read the eloquent and shrewd speeches in Thucydides’s History of the Peloponnesian War for profound insights into military conflict, diplomacy, and the behavior of people and countries in times of crisis. How to Think about War presents the most influential and compelling of these speeches in an elegant new translation by classicist Johanna Hanink, accompanied by an enlightening introduction, informative headnotes, and the original Greek on facing pages. The result is an ideally accessible introduction to Thucydides’s long and challenging History. Democracy, philosophy, individualism, mathematics, fine art—all of these foundations of ‘Western civilization’ were supposedly laid by the ancient Greeks. Today the country of Greece continues (yes, still continues) to face grim crises born of modernity, yet antiquity plays an enormous role in shaping how we understand them. The Classical Debt traces the deep history of the tendency to view contemporary Greece through the lens of its ancient past. It also argues that controversy about ancient Greece masks deeper anxieties about the essence of Western civilization. What values lay at its core, and who deserves a seat at the table? Does Greece belong in Europe, or does it simply belong to the European West? Antiquity has had a remarkably strong hand in framing these questions. Should ancient history really still matter so much today? [Volume co-edited with Richard Fletcher] What happened when creative biographers took on especially creative subjects (poets, artists and others) in Greek and Roman antiquity? Creative Lives in Classical Antiquity examines how the biographical traditions of ancient poets and artists parallel the creative processes of biographers themselves, both within antiquity and beyond. Work in the last decades has emphasized the likely fictionality of nearly all of the ancient evidence about the lives of poets, as well as of other artists and intellectuals; this book now sets out to show what we might nevertheless still do with the rich surviving testimony for ‘creative lives’—and the evidence that those traditions still shape how we narrate modern lives too. 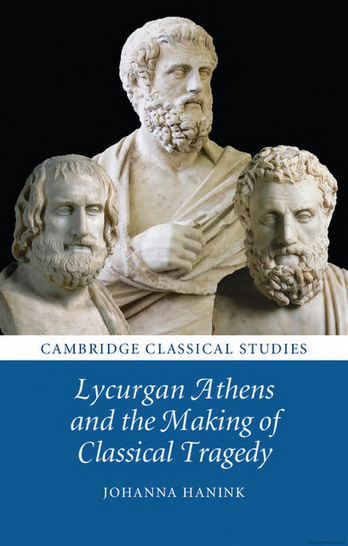 Through a series of interdisciplinary studies this book argues that the Athenians themselves invented the notion of ‘classical’ tragedy just a few generations after the city's defeat in the Peloponnesian War. In the third quarter of the fourth century BC, and specifically during the ‘Lycurgan Era’ (338–322 BC), a number of measures were taken in Athens to affirm to the Greek world that the achievement of tragedy was owed to the unique character of the city. By means of rhetoric, architecture, inscriptions, statues, archives and even legislation, the ‘classical’ tragedians (Aeschylus, Sophocles and Euripides) and their plays came to be presented as both the products and vital embodiments of an idealized Athenian past.